​Roberta G. Robinson, Dan Slavin, Wendy Temple and Lora Yuen. The Prism by Ed Friedman is a look at how we perceive older adults in this country through the lens of culture of origin, economic class and gender. Where the Sun Don’t Shine by Stephen Hersh is about the post-apocalyptic tale of a family and their devoted handyman trying to live a normal life in a subterranean bunker. Snow Angels by Pat O’Neill is a play where father and son reconcile the cycles of poverty and addiction when history repeats itself. All’s Fair by Jane Ann Valentine is a look at Carrie who wants to have a normal birthday dinner with her friends, but her husband Matt, has other ideas. Nathan is a director and actor working Off-Broadway, nationally and internationally. NY Performance credits include BAM, Judson Church, Classic Stage Company, the Acting Company, Aquila Theatre Co. Nathan is an Associate Arts Professor in the Department of Drama at NYU’s Tisch School of the Arts where he teaches Acting technique and advanced movement training. He was Head of Movement Training at the Maggie Flanigan Studio (maggieflaniganstudio.com) from 2004-2015 and is currently Head of the Movement Program at the Terry Knickerbocker Studio (terryknickerbockerstudio.com). Recent directing credits include The Crucible, A Few Good Men, Big Love, The Love of the Nightingale, Top Girls, The Three Sisters, Crimes of the Heart, Angels in America. This is Nathan’s third project with WCT. He has lived in Ossining for 6 years with his wife and three typically well-behaved children. Ed’s short plays have been staged throughout the NY metropolitan area by companies including, Gallery Players, Axial Theatre, EndTimes Productions, DarkNight Productions, Village Playwrights, Turtle Shell Productions, Long Island Theatre Collective, Hand to Mouth Theatre, Aery 20/20 Festival, Belmont Playhouse, as well as North Park Playwright Festival in San Diego, and SUNY Brockport. They include Secret Dreamers, Two Ships, Smoke Gets in Your Eyes, Keys to Life, The Jury Will Disregard, Out and About, Let No Man Tear Asunder, and Places. Ed is the co-founder and Executive Director of Lifetime Arts (lifetimearts.org). After years of resisting his wife’s entreaties to join WCT, “BECAUSE YOU NEED TO WRITE PLAYS AGAIN AND NOT SIT AROUND LIKE A LUMP,” Stephen finally relented and is now a devoted member. He has had several plays nurtured and produced through WCT, including Fish Lady and Mo and May in two Living Art Events, and Pieces of Panic which later became a finalist at the 2015 Aery 20/20 Festival, garnering him a Best Director award. He was also the lyricist for Going Up?! The Musical, winner of the 2015 New York New Works Theatre Festival. Thank you, my love. Steve has appeared in a number of plays throughout the region including Look Homeward Angel, Fences, Moon Children, Jitney, Raisin in the Sun, A Soldier's Play and Intimate Apparel at Nyack's Elmwood Playhouse. He has also appeared in a variety of independent films. I'm blessed to be sharing this stage with a professional, hard working cast. Originally from Yonkers NY, Steve is now residing in Rockland county. He thanks his family and friends for all their support. Dawn is an actress currently living in the woods Northern Westchester with her family. In a previous incarnation, she has been a Creative Drama teacher in the local school system and festival coordinator for the Ridgefield Independent Film Festival. She is excited to be currently working with other artists. Anne has performed on many stages thoughout her life. From Summer Stock to Soap Operas. Recently she's been acting happily married to her husband of 21 years. Her role as Wife, Mom, Realtor & her many jobs working at a restaurant has kept her busy, but working with these great writers, director & fellow actors of WCT is just what she needed. Athena Stebe Glorius is a Sophomore at Haldane High School. Athena recently played Katya in a one-Act play; “Uluru” at the Depot Theatre. Before that Athena played The Wicked Witch of the West in “The Wizard Of Oz " in Fimp’s Production, "Pride and Prejudice" and “Into the Woods” at Haldane Drama and “Jesus Christ Superstar” before that at the Depot Theatre. Athena also does Ballet, Tap, Modern, Jazz, and plays Soccer, Volleyball and Softball. Brenna Rose Hughes is a New York City based actor, dancer, and singer. She received her BFA in Acting and Minor in Musical Theatre from Marymount Manhattan College. Some of her recent credits include: Fairy/Dance Captain in A Midsummer Night’s Dream at The AlphaNYC, Madame Pernelle in Tartuffe, and Featured Dancer in Frank Wildhorn’s new musical Zelda. She teaches theatre and dance classes in after school programs around the city for Broadway Bound Kids when not performing or auditioning. Lucas Kane is a recent graduate of the University of Michigan with a BFA degree in performance; he performed in shows such as Almost Maine, Danny and the Deep Blue Sea, August Osage County and many more. More recently, he performed Kissing Will for Axial Theater ‘s Twisted Valentines series, starred in a few episodes of the ABC series, What Would You Do, and performed in the films The Experimenter and Viral. He also won “best actor” at the Aery’s Festival last year. Erik is happy to be onstage with WCT again. He is taking every opportunity to learn all that he can about acting and theater management. He enjoys redefining the roles of House Manager and Assistant Producer and helping his sister Karina on every WCT production. This is his fourth year as a "WCT‐lifer", Erik will always be proud to reprise his original role of "WCT Bartender" and help out in any way. A mold-man by day, Erik is proud to be an active member of WCT. ​Rahiem is an actor from Ossining. Performing as a Tuskegee airman in elementary school helped him discover his passion for art and entertainment. Rahiem continued exploring the arts, participating in theatre throughout school, and as a Hampton University Player. Rahiem is pursuing a career in film and television, currently appearing in numerous short films and web series. Recently he was nominated for best supporting actor at the Brightside Tavern Short Film Festival for his role in Riding with Sunshine. Roberta was last seen as Maggie in the WCT staged reading of Missouri Pals. She is so excited to once again work with the Westchester Collaborative Theater and continue her journey back to the stage after so many years away. Roberta is grateful for the opportunity to work on her craft in the company of so many talented, generous and amazing people. She is also very appreciative of all the support she recieves from her husband and her children. 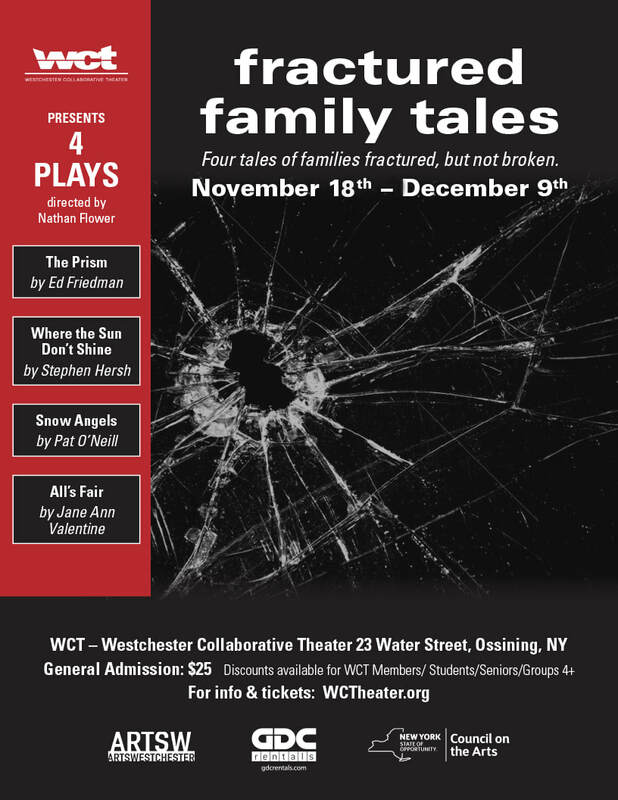 ​This is Dan’s first production with WCT, although he has lived in Scarborough/Ossining since 1998 with his wife Belkis, later joined by children Lucas and Sophia. Dan attended classes at HB Studio, NYC in the late 80’s, including scene study with Stephen Strimpell. He performed in an original production, Zelda -- with Carnegie Mellon University’s Scotch ‘n Soda Players. Dan is honored to have been selected to work with this ensemble, and greatly thanks Alan Lutwin and the WCT writers, directors, teachers, and actors -- collaborators all, for their creative energy and spirit of art. Dan dedicates his performance to his mom, who suggested he audition for a local dinner theater production when he was twelve. He didn’t get the part, but he got the theater bug. Thanks Mom! Wendy Temple is thrilled to be returning to the stage after several years, to play Kate in All's Fair. She is a graduate of Kean University, holding a BA in Theatre with a concentration in ASL. Her favorite roles have included Mrs. Jefferson in "Rent" at UCPAC and The Porter in Macbeth at Kean University. She would like to thank Jane, and Brandon for encouraging her to audition, her amazing friends, her wonderful family, and of course her incredible boyfriend Nick. Lora Yuen is an American whose mother emigrated from China to marry Lora’s father, a Chinese-American US Army veteran. Lora grew up in the Bronx, NY and is a current Ossining resident. She has been acting as much as her day job allows (and roles come her way). She was a member of Four Seas Players (a NYC Chinatown community theater) as a performer and stage manager. Recent credits include web ads for Mass Mutual and Johnnie Walker. She is delighted to be working with the WCT and thrilled to have this creative opportunity so close to home!